Investors that take advantage of a DRIP (Dividend Reinvestment Plan) get access to direct purchases of a company’s stock, funded by the dividend payments they are receiving. This happens automatically and is seamless to the investor. There are many stocks that offer DRIPs to investors, but some of them require the stockholder to pay a fee to use the DRIP. Obviously, that is a negative for the investor as these fees eat into returns over time. The good news is that there are companies that offer no-fee DRIPs, which help investors build their wealth more quickly when used with high-quality, dividend paying companies. You can see a full list of the best DRIP stocks here. Dividend Aristocrats are the perfect subset of stocks to examine for DRIP investors as they are among the best of the best in terms of dividend stocks. They have at least 25-year track records of growing dividends and are members of the S&P 500 index. 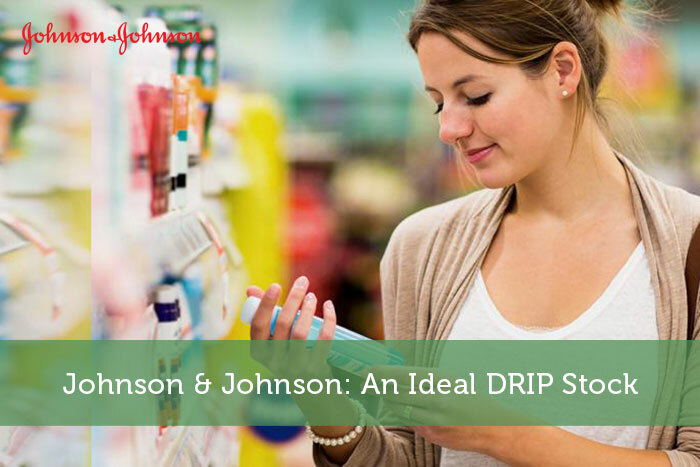 One Dividend Aristocrat that offers investors a no-fee DRIP is Johnson & Johnson (JNJ). We see it as among the best DRIP stocks. Johnson & Johnson is a diversified health care company that provides a wide variety of common use and specialized medical products around the world. The company derives about half of its revenue from pharmaceuticals, about a third from medical devices, and the balance from general consumer products. Johnson & Johnson was founded in 1886 and today, it employs 125,000 people around the world. The stock has a current market capitalization of more than $360 billion. The company has an impressive slate of dominant products in their respective categories. In fact, the company has 26 different product families that each produce at least a billion dollars in annual revenue, including 12 that have at least $2 billion in annual revenue. Johnson & Johnson reported full-year earnings on January 22, 2019, and results looked quite good. Earnings-per-share rose 12% year-over-year to $8.18. Revenue growth came in at 7% for 2018 thanks to broad gains across its segments. The largest segment, pharmaceuticals, grew its top line by 12.4% in 2018 thanks mostly due to strong organic growth. Worldwide sales for this segment rose 8.4% without the benefit of acquisitions and divestitures, completing another year of strong performance from the company’s core business. Oncology and immunology drugs were the big winners and drove a strong performance for the segment as a whole. Medical devices showed much lower growth rates throughout 2018 and finished the year with a 1.5% worldwide sales gain. Excluding acquisitions and divestitures, that number rose to 2.6% as strength in interventional solutions, surgery, and vision were offset by weakness in diabetes care and orthopedics. Finally, the consumer products segment saw 2018 growth of 1.8% on the top line, which was 3.2% excluding acquisitions and divestitures. The company suffered mightily in its wound care business, which declined by more than 13% in 2018. However, beauty care showed strength, as did OTC, which sells highly-recognizable products like Tylenol and Zyrtec. In total, 2018 represented another year of strong growth that also highlighted the benefits Johnson & Johnson accrues from its deep and wide portfolio of health care products. 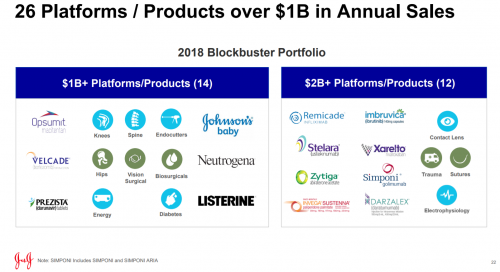 Johnson & Johnson is present in an enormous variety of segments and product families and over time, this diversification has produced good results for shareholders. Management expects earnings-per-share to come in around $8.58 for 2019, representing prospective growth of about 5% over last year. Based upon this midpoint of earnings guidance, Johnson & Johnson trades today at a price-to-earnings multiple of 15.9, which is nearly exactly in-line with our estimate of fair value at 15.8 times earnings. This is based upon the company’s own historical price-to-earnings multiples and given the rate of growth earnings should experience this year, we see it as a reasonable valuation. Given that the current valuation and our estimate of fair value are essentially the same, we see no impact to total returns from the valuation in the coming years. In total, we forecast total returns of about 9% for Johnson & Johnson annually in the coming years. Returns will accrue from a combination of earnings growth, which we see at 6% annually, and the dividend yield, which is currently 2.6%. As mentioned, we see no change from the valuation. Johnson & Johnson’s latest dividend declaration was for 90 cents, marking the fourth quarter of dividends in that amount. The annualized payout of $3.60 is good for a 2.6% yield today as the share price has rallied in recent weeks. Johnson & Johnson normally raises its dividend in April for May distribution, so we’d expect to see an announcement of a higher payout in the coming weeks. When investors elect to use the DRIP feature offered by Johnson & Johnson, the compounding effect of the dividend on one’s wealth becomes even more profound. If an investor bought shares today at the 2.6% yield and elected into the DRIP, that investor would automatically receive the 2.6% yield in additional shares each quarter as the dividend is paid. The second year, assuming a flat share price and no change in the payout, the investor would receive dividends on 102.6% of their original investment, compounding the impact of the dividend. Johnson & Johnson also continues to grow its payout – averaging more than 6% annual growth in the past decade – which creates a double-compounding effect from the DRIP. Over the course of many years, this impact can be enormous as the investor’s yield on cost grows over time. Finding high-quality dividend names with long track records of dividend growth – and no-fee DRIPs – is one of the best ways to build dividend stock wealth over time. We see Johnson & Johnson as a high-quality stock that has a deep and wide product portfolio that affords it strong earnings growth potential. With the stock right at fair value and the yield at 2.6% – a number that should be higher in a few weeks thanks to an anticipated dividend raise – we see Johnson & Johnson as offering attractive returns for dividend investors. When combined with the fact that the company offers a no-fee DRIP, we believe it is a terrific opportunity for investors to build their wealth over time.